This is our redesigned beginners bass guitar with our new headstock. 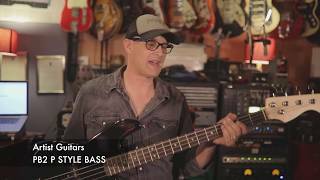 These bass guitars are designed to be easy to play so they are a great starting point if you want to pick up a bass for the first time. This is a full-size bass and is recommended for Adults or Children over the age of 12 (or younger if your child is strong and taller than 1.2m). Why wait to start learning bass guitar when you could get one of our great PB2 bass guitars and be playing in no time at all. We ship super fast!